Bathroom is a place where the morning of most of us begins. 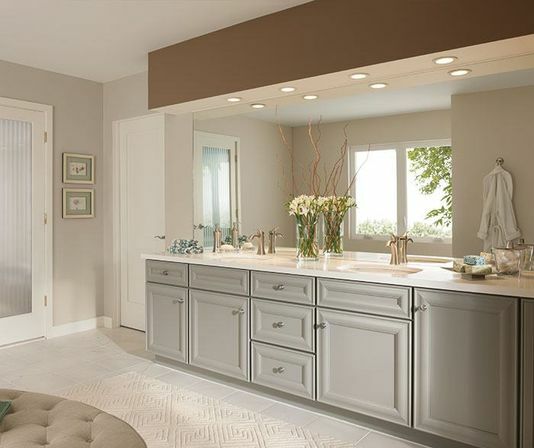 So to make the morning perfect we need to organize our bathroom in a perfect way. 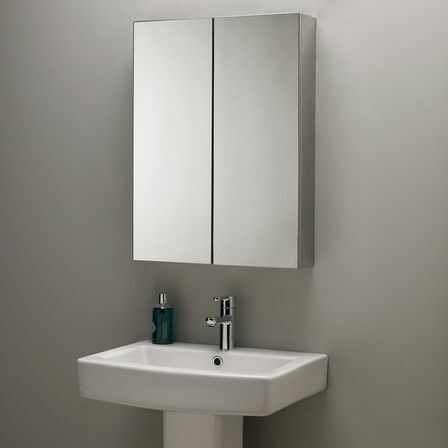 This also considers the bathroom cabinets based on the fact that most of our bathrooms have not much of square meters, but we still need to keep somewhere our hygienic and make up stuff so we definitely need to find where to place it. The bathroom cabinets can be so different not just based on the material it’s made from, but also on the parameters and it’s destination. We can use it for placing or hygienic stuff, make up or sanitary engendering cleaning products. 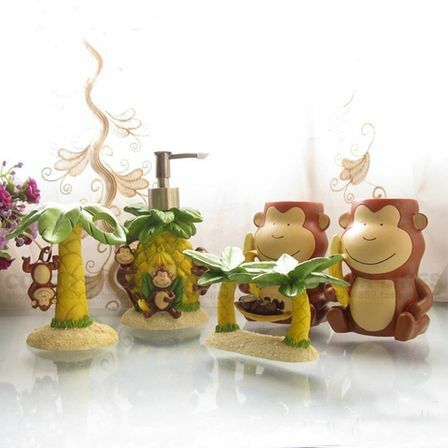 It’s gonna definitely save the useful space in the bathroom and solve such esthetical problems which gonna complete the modern looking bathroom. 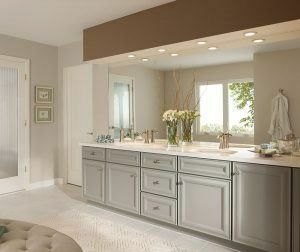 Overhead bathroom cabinets – it’s the most popular type. It can be standard or angular and usually mounted on the kronshteyns. And for those in which it’s planned to keep the heavy elements it’s usually provided with an extra fixing made by the screws. Embedded – are used in this kind of bedrooms that have some kind of niches or any other wall depressions. It helps to use the bathroom space more rationally. Specular – usually it’s getting placed above the sink and most of the times it has just the cabinet doors made from the mirrors. It’s not just spacious, but also looks really attractive. 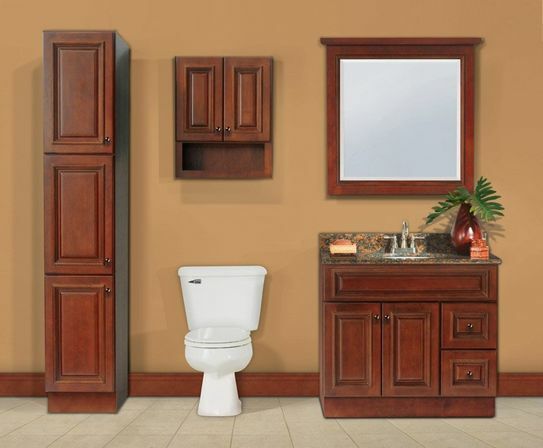 Angular – it’s perfect for the small bathrooms and can be established in any corner. 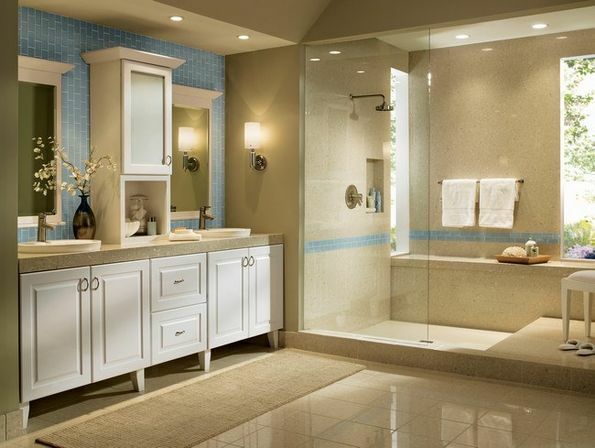 The bathroom cabinet – case – it’s main difference is the simplicity and ease of using. 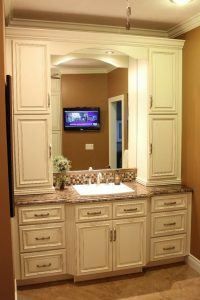 The bathroom vanity – is a really optimal kind of bathroom cabinet that is really great for the bathrooms with such a limit of space. Their shapes and forms can be so different it can have the pullout cabinets and even the flasket. The furniture that you choose to use in the bathroom should have a mass of advantages such as strength and stability for the high moisture and temperature changing as it should be ecological and lasting. So choosing the bathroom cabinet don’t forget it should be lasting and should be made from the moisture-proof materials. The most often used materials used for it are. Laminated chipboard – that material is made by the wood pressing with the extra resin adding. This material is absolutely moisture-proof because of its lamination. 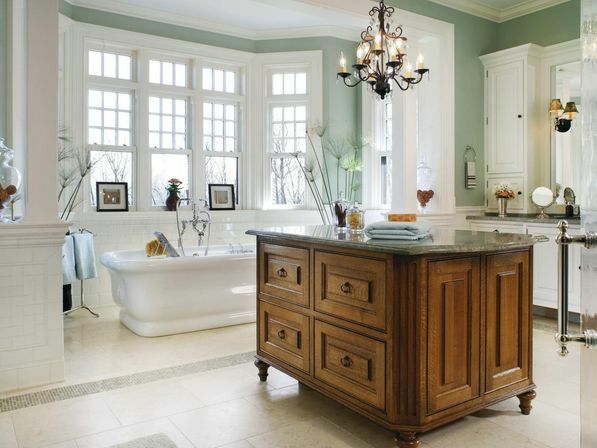 Moreover the color gamma of the bathroom cabinets made from this material is so different. MDF – it produced by mixing the wooden fibers and the syntactical glue. It differs by its stability to the moisture and the temperature changing. That’s why this kind of bathroom cabinets are gonna last for really long. Glass (mirror) – more often used for the decoration of the cabinet’s facade. This kind of furniture is also not afraid of the high-moisture because it’s made of material having the high absorbability. Choosing this kind of bathroom cabinet you need to make sure that the glass has a special protecting cover that is gonna protect you from the splinters in case of it’s breaking. The only thing is that the glass needs a really special care as even the small drop is gonna be visible on it. To avoid this you need to regularly rub it with the dry cloth. Natural wood. This material looks really gorgeous, but can’t be called really practical. It’s linked to the fact that the wood is getting deformed being placed in a bathroom with a high level of moisture, so it should be established only if you are the owner of a big bathroom with a good ventilation system. Most of the times this is an extra class production so it costs more then it’s analogues. Let’s don’t forget that each bathroom is a source of a high moisture which means that every time we have a shower there are the water drops they can fall all around. Moreover the steam settles all around looking being a condensation including the furniture. But these problems are easy to remove and it’s easy to make by establishing the ventilation system. Another variant is to place a heated towel railway that will also contribute to the fighting with the moisture and condensate. It can be switched to the Stationary heating or work from the electricity. 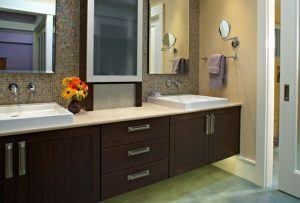 To make sure your bathroom cabinets are not afraid of moisture you need to refuse the models made from the natural wood and give a preference to the laminated DSP or MDF. The bathroom cabinets that have the special moisture proof covering on it can be used in the bathrooms of any size. Also choosing the bathroom cabinets you should pay your attention on the shelfs, walls and the other accessories and make sure it’s fully covered. As there should be no any wooden cuts that are gonna soak an extra moisture getting deformed by it. To get rid from the misted glass and mirrors you can get a really good quality one forced ventilation system or handle it’s surface with the special product that you can buy in the shop or make by yourself by using the glycerol or gelatin. 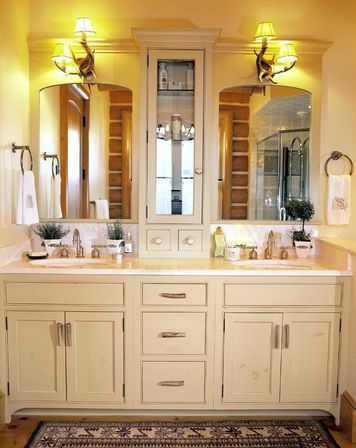 A really attractive solution for your bathroom interior decorating is getting the bathroom cabinet with the mirror, which is gonna consolidate the practical and an attractive side as well. 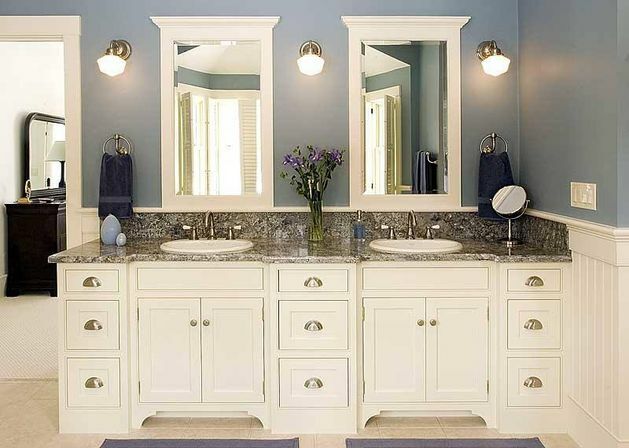 This kind of bathroom cabinets has a mass of advantages such as. The possibility of even increasing the quantity of the working by space by establishing the special shelves inside of the bathroom cabinet. Here you can place all your shower stuff that was always taking the space on the edge of the bathroom vanity. The construction combinations are so different. It can be placed on the floor or at the wall angle. The inside lighting can be easily established. 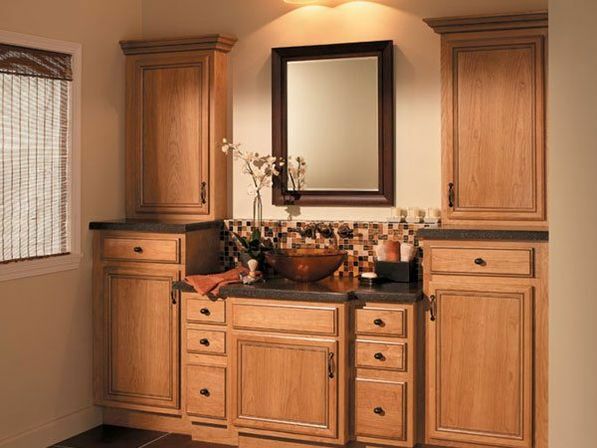 This kind of bathroom cabinets is always made from a really good quality material that is fully covered to be saved from the moisture effect and can be done in any texture and color. 1) It needs the special care taking as it’s not that easy to clean it just by any wet cloth. 2) it’s rally sensitive to damaging and can be easily broken. The mirrors visually make the space looking bigger so can be represented as the single decorative elements or can totally complete the rest of the decor. For this you need to know how to combine it with the rest of the furniture and the sanitary engendering in the right way. Also choosing the mirror bathroom cabinet you should also take into accounting that the mirror can make some optical illusions, especially the mirrors with the big surfaces. Also don’t forget to pay your attention on the fact that the mirrors should be always clean or otherwise its gonna effect the rest of the interior not in the best way. 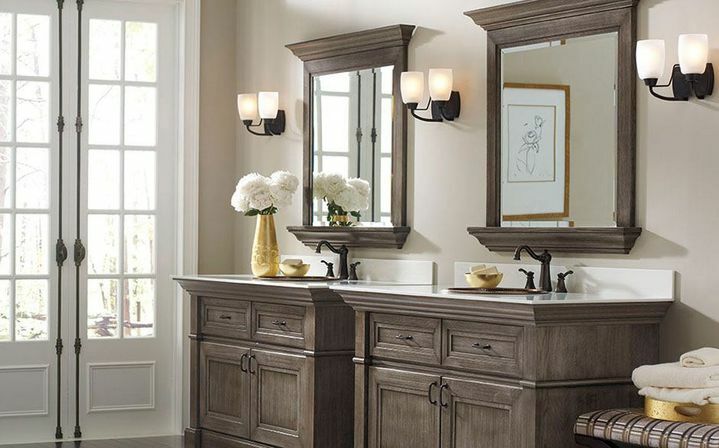 How to establish a bathroom vanity. The procedure of the bathroom cabinet establishing. 1) First you need to make a marking measuring the width of the cabinet using the level and to replace on a horizontal the dotted cabinet’s coordinates. 2) Then we should establish the mount into the recently drilled places for what we gonna use a drill or a screwdriver. 3) In the holes we’ve got we can put the bungs on which we screw the hooks and place our bathroom cabinet and it’s done!